Hands up all ye who could not keep up with the galloping pace of December this last year! And now those who amidst all the Christmas stress threw a little birthday get-together shortly before Christmas Eve and cooked all weekend to make the cutest cake (ever) and a spread of Ottolenghi’s scrumptious vegetable dishes (aubergines!). A fair few courses were getting axed as the prep day progressed, where are these Heinzelmännchen (German elfs) when you need them to chop and mix and whisk up all those extra-super-delicious sauces for each recipe?! So, here am I trying to cope with the loss of the flickr ‘sharing-to-wordpress’-button. I am so not a super tech-savvy person (not at all), I fiddle around and mangle the stuff until my posts sort of look right & pretty and now I am a little lost & upset. I only found out a few days ago and thought, you know, they just might leave it there but not do any maintenance and forget about it. No, apparently not: the feature is annihilated, chopped, no mercy for the amateur-cook-blog-fiddlers, the improvisers amongst us. Tish-tosh, enough of the moaning: I wanted to change the appearance a little anyway, so I am taking the gauntlet & work (read: fiddle or hack) on that. 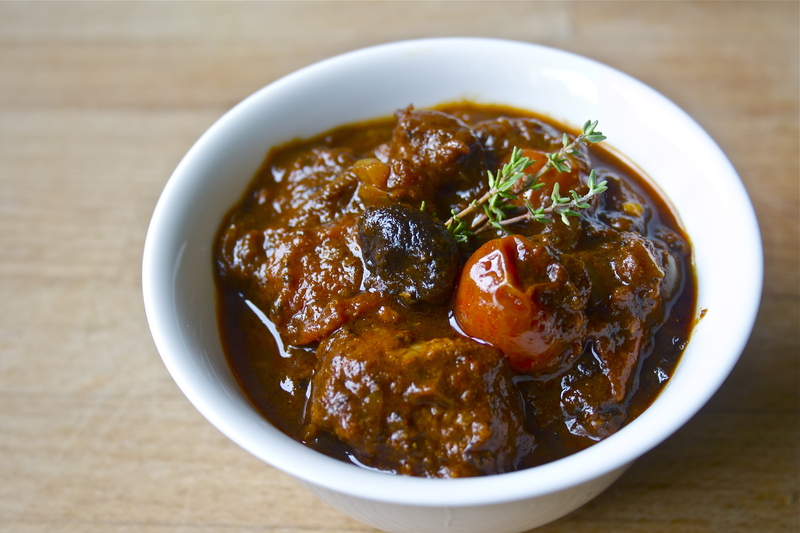 Here is another challenge: braising. I had to brush up on my cooking terminology and basically everything that is either previously browned or not (good, if you do not want to kill the fish twice) and than slowly cooked or simmered (often braising and simmering are used synonymously) in liquid. Braising works for wonders for fresh tuna which stays succulent and moist instead of being rendered into a bone-dry brick when pan-fried or grilled. At least that is my experience. I prefer my fish briefly seared on the outside and raw or just a little translucent on the inside, my husband doesn’t. To find a middle way, turned my slice – more often than not – into the said sad & saw-dusty brick which apparently some people (yes, you, darling) prefer. Braising tuna this way pleases the both of us, is heavenly easy to prepare and absolutely foolproof: you’ll end up with succulent fish, a fragrant liquor that is a joy to mop up with lots of torn bread and the feeling of having just eaten quite a healthy meal. Update (after dinner): we have just had the tuna again and I have to say, ultimately (& optically) I prefer the oven method since it concentrates the flavours much more and adds a nicer colour to the fish. The braising pan method returns a lovely concentrated sauce though the fish stays pale (see here). In the end, it depends on your visual preferences and if you want to heat up the oven. Preheat the oven to 175°C / 350°F. Dry the tuna slices by patting them with a paper towel, rub with garlic puree and season with salt & pepper. Halve or quarter the tomatoes (I think there is no need to skin them), chop the olives and finely dice the onion. Toss in a bowl together with the capers & the chopped herbs. 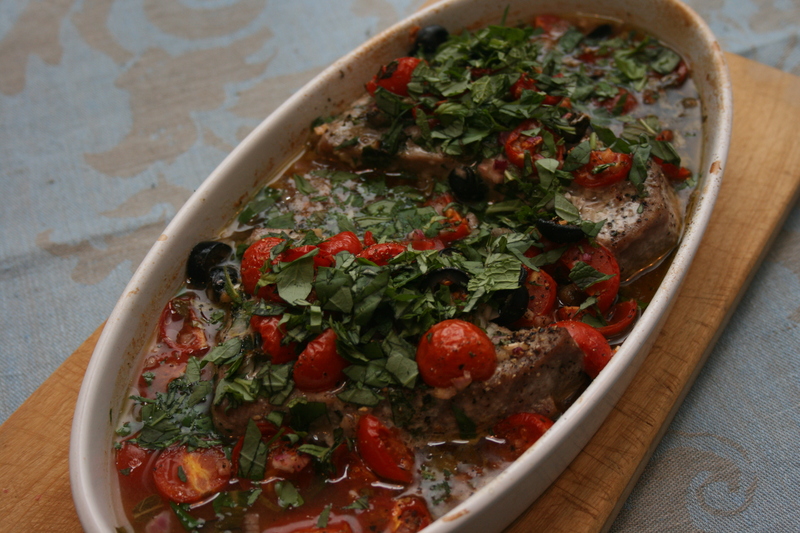 Prepare an ovenproof dish or a braising pan with a little olive oil (1 tablespoon) add the tuna slices, top with the tomato-olive-caper-herb mixture, season with a little salt & a lot of black pepper and pour over the white wine. Let the fish braise gently for about 20-30 minutes depending on the thickness of your slices. Sprinkle the fish with more fresh basil & mint, serve with the liquor and a crusty Italian country loaf. Alternative cooking method: Prepare the tuna as above in a braising pan (I used a Le Creuset cast iron braiser), cover with a lid and braise for about 20-25 minutes over medium heat depending on the thickness of your slices. Garnish with more chopped herbs & serve with basmati rice or rustic Italian bread. Den Backofen auf 175°C vorheizen. Thunfisch mit einem Küchentuch trocken tupfen, mit Knoblauchpüree einreiben und mit Salz & Pfeffer würzen. Die Tomaten je nach Größe halbieren oder vierteln (ich finde das Häuten immer ein wenig zu viel Aufwand), Oliven klein hacken und die Zwiebel fein würfeln. Zusammen mit den Kapern & den gehackten Kräutern vermischen und beiseite stellen. 1-2 EL Olivenöl in eine ofenfeste Form oder eine flache Pfanne gießen, die Thunfischscheiben hineingeben und mit der Tomaten-Oliven-Kapern-Zwiebel-Kräutermischung bedecken. Wein angießen und nochmals salzen & kräftig pfeffern. Für ca. 20-30 Minuten backen, anschließend mit mehr frischem Basilikum & Minze bestreut servieren, dazu frisches rustikales italienisches Landbrot mit einer ordentlichen Kruste reichen. Alternative Methode: Den Thunfisch wie oben beschrieben in einer niedrigen gußeisernen Pfanne mit Deckel vorbereiten und auf mittlerer Hitze für ca. 20-25 Minuten garen. Der Fisch bleibt saftig, nimmt aber keine Farbe an, die Sauce wird konzentriert. Den Fisch mit mehr frischen Kräutern bestreuen und mit rustikalem italienischem Brot oder Basmatireis servieren.